Kylie, Jackson & Addison - 3 string Bali Sterling Silver Mother Bracelet. Shown on a 3-string slide clasp with an add-on Puffed Heart Charm. Price is per string. This is a 3-string bracelet shown with an add-on Puffed Heart Charm. The price is per string. You may have up to 5 strings. I put Kylie, Jackson & Addison on their own strings. If you have short names you could fit 3 names on 1-string. This bracelet comes with a free lobster or toggle clasp. I recommend a slide clasp with 3, 4 or 5 string bracelets. The letter blocks are 5.5mm .925 sterling silver with a letter on all 4 sides. The beads are all .925 sterling silver. I have included large decorative Bali beads and alternated between 6mm smooth round and 5mm smooth round sterling silver beads. I make and ship everything the next business day. Questions? 615-490-2177. 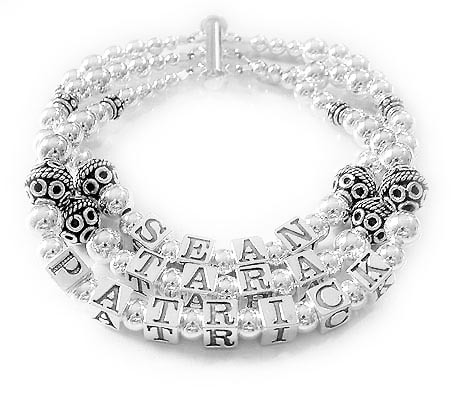 Sean, Tara and Patrick - 3 string Bali Sterling Silver Mother Bracelet. Shown on a 3-string slide clasp. ELIN, ELLA, EMMA (no crystals) - 3 string Bali Sterling Silver Mother Bracelet. 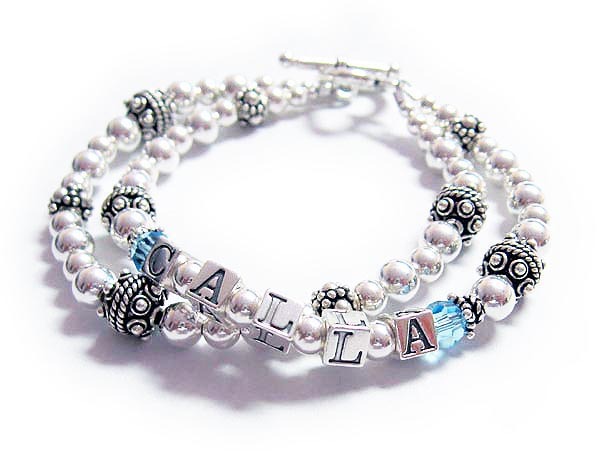 This is a 2 string bracelet with CALLA and her birthstone crystals (March) before and after her name. The second string is an accent string and is blank. Shown with a toggle clasp. 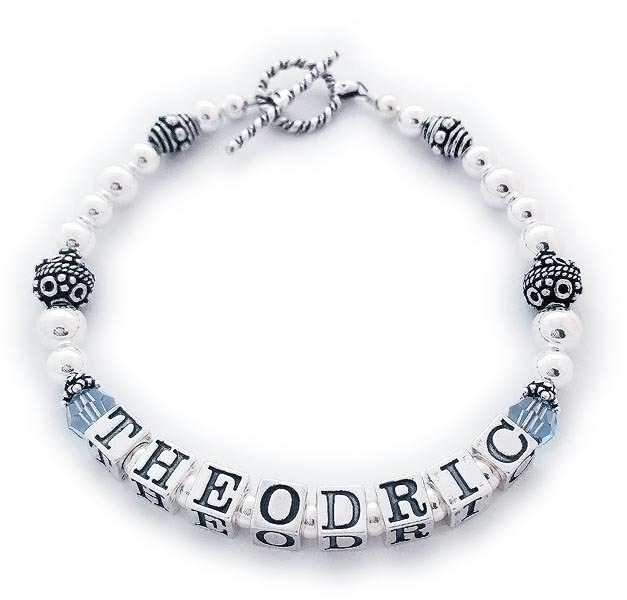 This is a 1 string bracelet with THEORIC and free December birthstones before and after THERODRIC. It is shown on one of my free Twisted toggle clasps. Jake & Connor - 2 string Bali Sterling Silver Mother Bracelet. Shown with a Twisted Toggle Cladsp. 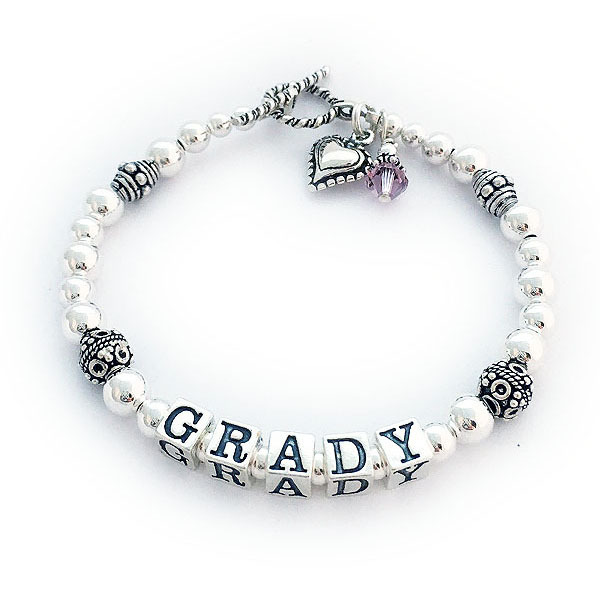 Grady 1-string Bali Bracelet shown with 2 add-on charms: Beaded Heart Charm and a Birthstone Crystal Dangle.